Encourage the inclusion of G4S in the list of companies the city of Berkeley will divest from due to the organization’s complicity in the unjust U.S. prison system and Israeli interrogation facilities that incarcerate and torture Palestinian political prisoners, including children. Hire our first communications coordinator to amplify our Christian Voice for Palestine. See four new denominational divestment wins from the Evangelical Lutheran Church, Alliance of Baptists, Unitarian Universalists, and Catholic Conference of Major Superiors of Men. Bring Palestinian voices to Presbyterian and Unitarian Universalist General Assemblies. Lift up the wisdom of our elders and capitalize on the energy of our youth by launching our Clergy Support Network and Praxis Seminary Working Group, and by expanding our successful internship program. The Christian Media Center presents 2016 in review: key events by month in the Holy Land. A year filled with changes and news. Accepting the invitation of Pope Francis, the Holy Land opened its Holy Doors for the great Jubilee of Mercy. and Gaza, Haifa, Amman and Nicosia. Thousands of pilgrims from around the world entered the sanctuaries, in search of the merciful face of God. The Christian Media Center presents: In the morning of Thursday, December 29, the eastern Christian churches gathered in the Custody of the Holy Land, in the Latin Patriarchate of Jerusalem for the traditional exchange of Christmas Greetings. An ancient rite: it has been a busy morning in the holy city, marked by the pace of the sticks of the kawas, the beaters with the Ottoman fez, just before the arrival of the different parades: the Eastern Christian churches indeed traveled to the Custody of the Holy Land and to the Latin Patriarchate of Jerusalem for the traditional exchange of Christmas greetings. As per tradition, Greek Orthodox, Armenians, and finally Copts and Syrian Orthodox followed one another in the Custody in an atmosphere of brotherhood, joy and harmony. Cooperation, respect and mutual understanding were the basis for the exchange of greetings, and once again emphasized the importance of a Christian community united in faith as well as in the everyday life. The attack against a church in Cairo, on December 11, claimed by the Islamic State, besides wanting to attack Christians and punish the Copts for their political positions in Egypt too, is an attack against the President Abdel Fattah al-Sisi. Twenty-five people were killed in the explosion in a prayer room next to the cathedral of Abassiya, in the popular heart of the capital. At the beginning of Advent we started listening to the Word that invited us to watch. We went through the times of waiting in the company of all who have hoped and longed to see the day of salvation. We paused contemplating the decisive moment in history, the one when this promise was given to the faith of a Galilee woman and her husband, a just man listening to God’s Will, which is always a will of life and peace. Tonight, again, we are in the company of people who watch: “there were some shepherds in that region staying in the fields and keeping the night watch over their flock” (Lk 2:10): there comes to them the announcement of a great joy. Everything could make us think of having arrived at the destination, of having completed the course. But this is not so: alongside the announcement of a great joy there is also an invitation to begin a journey to search for the place on earth where this joy is placed. Today, therefore, the wait is transformed into the journey. We have to look for Christmas. Latin Patriarchate of JERUSALEM – On Tuesday December 6, 2016, a conference entitled “Who are the Christians in Israel today?” was held and presided by Fr. David Neuhaus SJ, Latin Patriarchal Vicar for Hebrew-speaking Catholics in Israel, at the Tantur Ecumenical Institute. Please find below his intervention. In January 2015, emeritus Latin Patriarch of Jerusalem Michel Sabbah addressed a congress at the Hebrew University of Jerusalem on the Christian Palestinian Arab citizens of Israel. He was insistent that the Christians in Israel have a vocation, saying, “The vocation of the Christian is to point the way to peace and to walk in its path. This peace must be built on the dignity of each human being, Palestinian and Jewish. Blessed are the peace makers for they truly serve God and humanity, all humanity, Palestinians and Israelis and the whole region.” Who are the Christians in Israel today? Christians in Israel belong to a mosaic of communities. This coming Shabbat, we will have the opportunity to explore anew the meaning of Hanukkah. I hope we will go deeper than the Hanukkah story that is now most often shared — the Talmudic legend of the oil that should have been enough to last for one day but instead lasted for eight. In his weekly reflections which he shares with us, Patriarch Emeritus Michel Sabbah is quoting Prophet Isiah: “Strengthen all weary hands; steady all trembling knees; and say to the faint-hearted: Be strong, do not be afraid’ (Is 35: 3-4). Very comforting words indeed, but much easier said than done when we have been subjugated to a brutal occupation over and above a dispossession that has lingered for almost seventy years. As strong as they try to be, the Palestinians are afraid and children are terrified as they never know whether they will find their home when they come back from school, or just a pile of rubble, or when a dear father, brother or sister will be picked up by the army in the middle of the night. This year the main Christmas tree in Bethlehem shines brightly. In years past, though, it was sometimes a struggle to light it up because the city couldn’t devote the funds to it. It’s a shame, because this historic and spiritual city could be doing so much better. 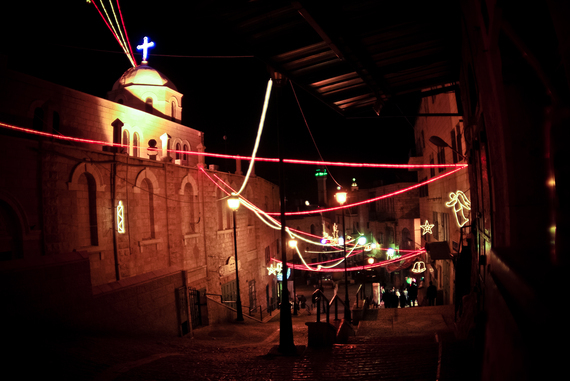 Bethlehem is a UNESCO world heritage site, and it’s also an example of a place where Christians and Muslims live side-by-side and are proud of their shared history. I always make sure to visit Bethlehem on my frequent trips to Palestine. As the birthplace of Jesus, its Church of the Nativity is a must-see stop each time I go. Tourism, as you might imagine, is the main source of income for Bethlehem’s economy. But in recent years, tourism has dwindled. The separation wall cuts it off from the flow of commerce and tourism. And as a result, the city budget is tighter than ever. Hospitals and schools are deteriorating, and water access is limited. Its land area is constantly shrinking, as the few plots of greenery get built up.